Last Monday I took a day off work in order to go to an all-day workshop at Pudding Yarn in Calgary. 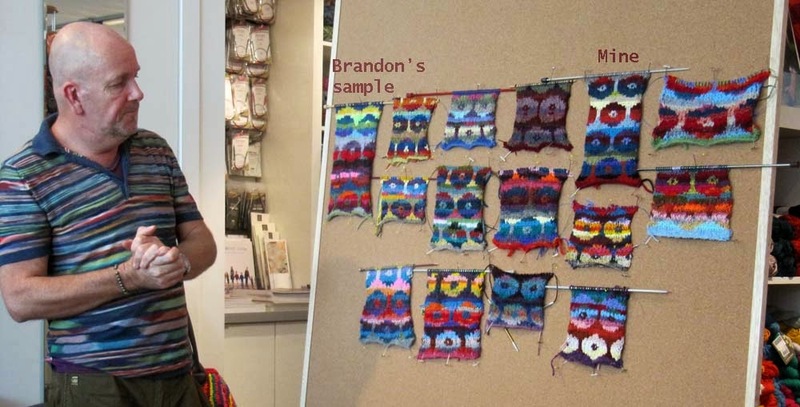 It's a class that I've wanted to take for ages - a color class with Brandon Mably. Decades ago my knitting was hum-drum - mostly sweaters in a single color or with only a little bit of an accent color. Then along came Kaffe Fassett with his theory that 20 colors was a good start and, when in doubt, add 20 more. I was immediately smitten and my knitting changed right then His partner, Brandon, continues this way of knitting with his own input. I also discovered all of the beautiful Rowan colors and yarns. To this day, it's my favorite yarn company - although I do wish they wouldn't make changes so often. I'd done some fairisle and intarsia but the newly-discovered designs were over the top and I jumped right in. No one told me that it was going to be difficult to knit them, and so it wasn't. I've knit several designs from these two designers, as well as others on the Rowan team and there are many more in my queue. I liked the results but I have to disagree strongly with one of the theories presented. Brandon, and Kaffe, say that you shouldn't worry about knots and you shouldn't show the inside/back of your work. I can't tell you how much this goes against the grain with me. You will never find a knot in anything I knit. Also, while the inside of a sweater will not look the same as the outside, it can be just as neat and tidy. I've been asked by knitters to show them the inside of a sweater I've knit and I don't hesitate to do so. I'm proud to show off both sides of anything I knit. I will agree to disagree with the designers on this point. Near the end of the class Kaffe came into the store and sat down at the table at the back and worked on a design. 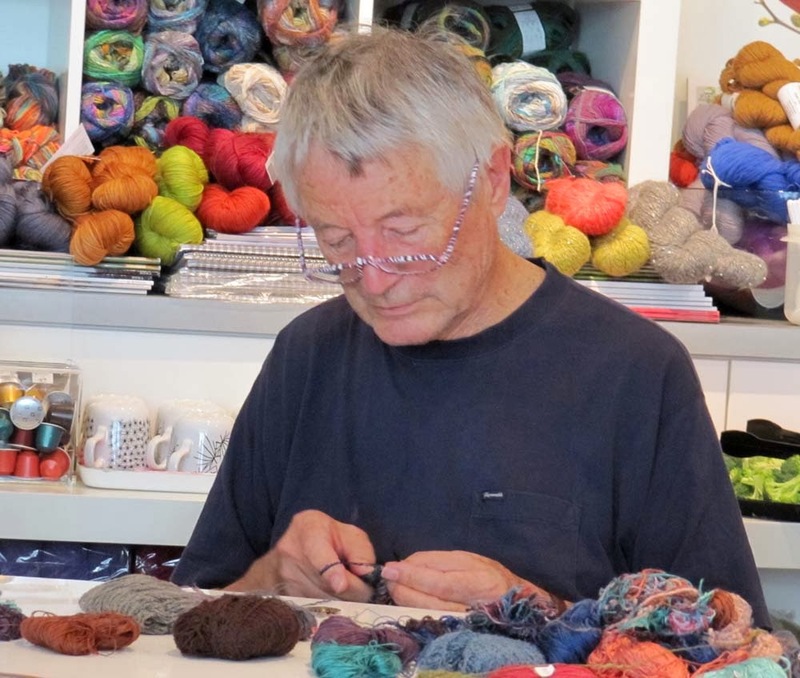 I have to admit that it was a unique feeling to be knitting away and to looked over and there was Kaffe Fassett knitting away, too. He's been an inspiration to me for decades. A number of garments were brought to the class and I'll post pictures of them in the coming days.